Cycling is in your soul if you look RadioCorsa! You’re cycling if you look, no need to put a memo, Radioride every Thursday night. You are cycling if you grant that program on TV (Raisport), with all the passion and the pleasure that it takes: to enjoy the news of cycling, the great cycling, and not only the big one: you find also those services or in-depth-to put it as it should-that T They find space in the sports routine but here they are treated in the right size. And with Love. For cycling precisely. Sei del Cycling If your name is Andrea De Luca, first and conductor commentator, from the bike (indeed professionally from the engines) to bicycles even those rides – we saw him soaked in rain on Sunday, November 28 peding fun as a kid in Saddle to his Colnago Nerogrigia for the Vigorelli Ghisallo. You are cycling if you have the history of cycling, as well as in books and in the pen, so cut to measure that you see even in the tie: that of Beppe Conti, the historian of the two wheels par excellence. Sei del Cycling if from the studio TV1 of the Rai headquarters of Corso Sempione in Milan, the coordination and… services, find Franco Bortuzzo that calmly Savoy (rarity of these times) manages with passion almost silent a sports column dedicated to two wheels that for He’s not just a trade like any other. And this is understandable. It is that job that takes you to take your bike at six o’clock in the morning, when you are fantastically away from the tour or the tours, to try that arrival, that ascent, that passage of the champions…. Here. One of the cycling. You will then understand that behind these signatures-for all big names of cycling in the small screen (even small because today you do tell even on the tablet)-there is a team that ride and does it with a relationship: the smile. With a passion that has turned into a cultural idea: to give space to the stories of the Italian museums that tell the history of cycling. Places of memory that-if you’re just cycling-know or want to know sooner or later because there, as in Radiocorsa, you feel a little ‘ at home. Here is that Thursday first of November, remembering in a very special way, all but just all the champions of the two wheels, the weekly program Raisport hosts a deepening dedicated to the Cycling Museum Madonna del Ghisallo of Magreglio, guests in the studio Antonio Molteni, President of the foundation that guides the museum, and his director Carola Gentilini. And with them, in Milan, will enter a heirloom from chills and not for the cold: because it comes to feed there was need the extraordinary tale of this museum the bicycle of Fausto Coppi that established the record of the hour at Vigorelli, November of 1942, on a day of pause Of the war, in a bombarded Milan… History, Cultira, sport. Emotions. Radiocorsa with this first episode dedicated to the Ghisallo Museum, founded 12 years ago by Fiorenzo Magni, touches the first of a long series dedicated to an Italian museum network that for now is connected by passions and conductors of passion, but will soon become the network of Cycling museums in Italy. A nice way to team up here, too. As they wanted the biancocelestial of Coppi, as the charismatic Fiorenzo Magni wanted, as he taught preaching the good without clamor the great Gino Bartali. Trails of history of cycling that we like to take. Enjoying the benefits of remembrance. That is not nostalgia, but help and awareness of the value of our country that is Pedala. See you on TV. Radiocorsa, Thursday 1 November 2018, at 22.30. Please note. If you lose this bet you can review (like all the others on the site of Rai Sport http://www.raisport.rai.it, in the Hompage, scrolling down until you cross the section “Rubrics”, where every week is posted the episode of Radiocorsa. 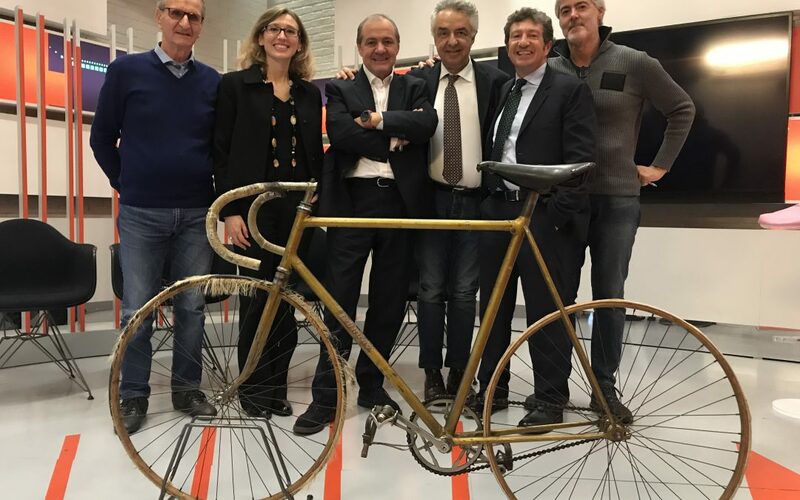 At this LINK you will find the episode of the day 11/10/2018 when the project dedicated to the museums of cycling was launched.